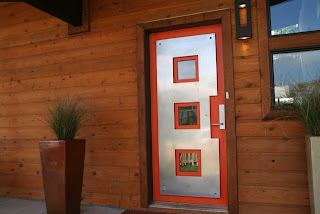 Does anyone out there make affordable doors for the mid-century modern aficionado? Thankfully, yes. 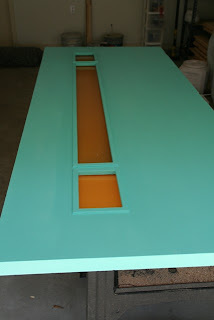 Custom doors by Shannon Walker. Met Shannon through Ebay after stumbling upon a stunning door. She's very friendly and responsive. No doubt she's a craftsWOman. Beautiful product. Fair price. I will soon be working with her and will report back. In the meantime feel free to email her (shannonwalker69@yahoo.com) with your doorway needs. She welcomes custom orders. Another source is crestview doors, but they don't give those things away. I will be working with Shannon. 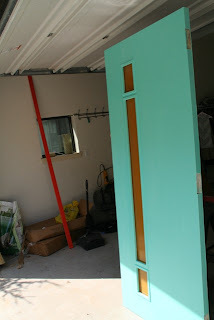 that teal door is awesome!